Four thousand three hundred fifty targets, 87 participants, 12 schools and one champion. The fledgling Whitehall trap team defeated all comers at the regional Foothills Challenge on Sunday. Twelve teams competed against one another at the Hudson Falls Fish and Game Club, with only one team walking away champions. The Railroaders claimed the top spot by a fair margin of blasting 210 birds. 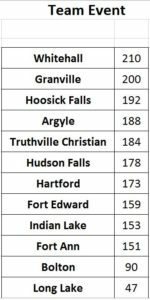 Granville wasn’t too far behind with 200 birds claimed while Hoosick Falls rounded out the top three with 192. Hartford placed seventh with 173. The Foothills Challenge is a regional competition allowing area schools with trap clubs to compete at a level similar in scope to sectionals. For a comparison, Redmond said the Foothills Challenge is similar to Section II. Prior to the competition, the shooters were broken into classes utilizing the same alphabet system schools use for their athletic programs, from A through D.
“That’s based on their averages during the nine weeks of shooting,” Redmond said. Whitehall had seven shooters compete of which four were in Class B, one in Class C and two in Class D.
Other local competitors included Granville, which sent 11 shooters of which one was in Class A, five in Class B, three in Class C and two in Class D. Hartford also sent five shooters with one in Class A, two in Class B, one in Class C and one in Class D.